Charles Flower (1863–1927) was a “Remittance Man” and received a hefty allowance from his family back in Ireland on the condition that he relocate in order to avoid further scandal brought upon by his behaviour. Charles came to the Birtle area around 1889 and soon became accepted as an elite member of the community. He built grand houses both in Birtle and on his farm in the Hooper’s Lake area. He also was the proud owner of the first Cadillac in Birtle. 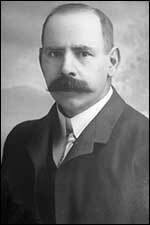 In 1898 Charles was elected Birtle’s second mayor, a position he held for one year, replacing J.S. Crawford. He served a second term from 1901–1903. Charles married Violet “Ruth” Beatrice Kealy in 1895 and together they had four children. They divorced in 1913. Charles lived in Birtle until his death in 1927 and is buried in the Birtle Cemetery. During his life, Charles took many pictures of the Birtle area. We are grateful to his descendants for donating his photo album to the Birdtail Country Museum. For more information about Charles Flower, see Birtle Begins, pp 32–35. Copies for sale are available at the Municipal Office or Pharmacy in Birtle, and a free copy is in the library.